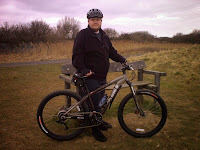 Other than doing an installation/test ride around the car park when I got my bike, today was my first cycle ride. My kids have both got bikes and up until now, my wife and I have walked around the parks etc and they've ridden their bikes. In preparation for me getting my bike, I managed to get my wife a second-hand mountain bike so she could come with us. The first ride was a trip around Shinewater Park, which is practically next to my house, with my wife and youngest son who's 6 years old. The ride was fairly easy but the pace was quite slow as my son couldn't manage the pace that I wanted to do. All in all, it was a nice and gentle first ride. I bet your little lad was made up that his parents were finally riding with him! He loved it and since then I've ridden with my eldest son 3 times and he loves it too.